The Geeksphone's Peak+ is up for grabs not to all but atleast to the European buyers at the Geeksphone website for €149 (Rs 11,600.00). 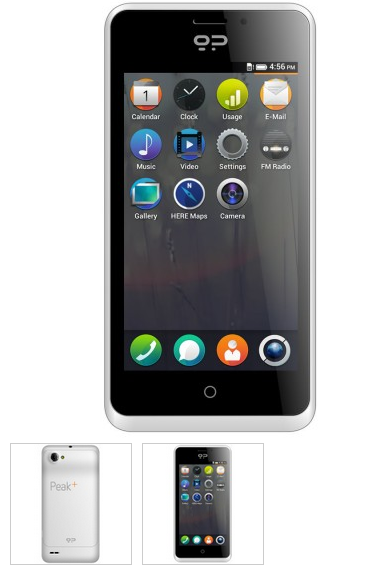 This Mozilla Firefox operated smartphone will run on HTML5. The elder siblings of Peak+, Peak and Keon from Geeksphone were sold out in matter of hours when they came up for sale. And with Peak+ the Geeksphone guys have pushed the envelope as far as the hardware is concerned. Peak+ will come with the high end CPU Qualcomm Snapdragon S4 8225 1.2Ghz x2 with a 1GB of RAM. It will have a internal storage of 4GB with a microSD card slot for expansion. The smart phone will run on both 2G and 3G bands but will not have LTE (4G). The display will be a 4.3 inch affair with 8MP camera on the rear and 2MP on the front. Connectivity options include Bluetooth 2.1 and Wi-Fi. The smart phone will have a FM radio receiver. The rear camera will have a flash. And all this will be powered by a 1800 mAH battery. One the insides, the Peak+ will be running on the latest Firefox mobile operating system version 1.1 . The Geeksphone and Firefox will make 25GB of cloud storage space available to all buyers. And as usual, playing games on the Firefox phone should be fun due to its HTML5 capabilities. If you are in Europe and want to give a try to this baby head to the Geeksphone marketplace here to order it now.